ALEPH is delighted to sponsor a once-in-a-lifetime guided adventure through the history of Jewish Spain. Your Tour Leaders: Rabbi Leila Gal Berner, Rabbi Marcia Prager and Hazzan Jack Kessler bring history alive with scintillating lectures, stirring Sephardic music, sweet Renewal-style blessings to start the day, fabulous food, superb accommodations, and best of all… the most wonderful fellow travelers, including YOU! Our journey begins in Barcelona and ends in Madrid, winding through centuries of Jewish history in medieval and modern Catalonia and Spain. 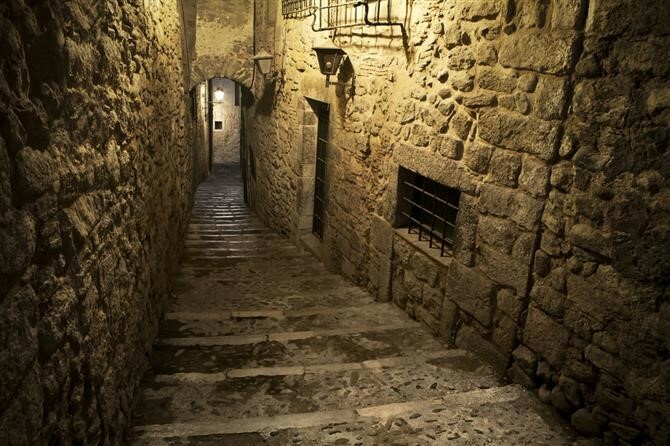 Walk through the streets of Medieval Barcelona where Rabbi Leila spent two years researching the lives of Jews of Barcelona 700 years ago. You will hear accounts of their lives, their challenges, and learn of their interactions with the Christians of that city. In Girona we will explore the beginnings of Spanish Kabbalah, and recall the courage and wisdom of RaMBaN (Nachmanides) who debated a Dominican Friar in the famous disputation of Barcelona, representing the entire Jewish community, and won! But his prize was having to escape, leaving his family’s centuries old home to begin a new life in Jerusalem where he continued to teach. In Grenada, at the exquisite Alhambra we will hear the words spoken at the very place that Queen Isabella and King Ferdinand declaimed the edict expelling the Jews of Spain in 1492. In the magnificent Gardens of the Generalife we will hear the music of the fountains immortalized in the verses of the Spanish poets. In Cordoba we will listen to Yehudah HaLevi’s poems only a few meters from where he lived, in a Plaza now named for him. We will visit a small and beautiful synagogue in which RaMBaM (Maimonides) once prayed. In Toledo we will come to understand how the Jews’ status as dhimmi (protected people) under the Muslims affected the architecture of their houses of worship and the rhythms of their lives. We will celebrate Shabbat together, with candle-light and song, Spanish/Jewish Sefardi melodies and prayers, Torah and blessings. All Ways Travel, the 2011 Winner of Travel Impressions “BEST of the BEST” Award. Price per person, double occupancy $4667 includes airfare from Philadelphia to Barcelona, and Madrid back to Philadelphia and air taxes; We have a great airfare deal, but if you want to get to Barcelona and back home on your own, a price reduction will be factored in, of course! Price is per person sharing a twin room. Traveling by yourself? We will help match you with a new best friend, who shares your style and needs, as best we can! Generous Buffet Breakfast included and specified other meals, including Shabbat. Travel will be comfortable and food will be great. We have designed this trip to be emotionally and intellectually enlivening, and physically gentle. While there are walking tours, the pace is easy, and not too taxing. There is plenty of time to rest, relax, socialize, and delight in the rich beauty of each place! Space is limited, and the time-frame for registering is tight. Deadline for registering is December 15. Tell us a bit about yourself, and we will welcome you to our group! We’ll want to know how to contact you so we can send you our “Getting-to-Know-You” form and welcome letter. View the full itinerary on alephspaintrip.com. Posted in ALEPH Programs and tagged Spain. Bookmark the permalink.